Mount Kilimanjaro is in fact a dormant volcano. Its two peaks stand about 11 km (about 7 miles) apart and are connected by a broad ridge. The highest peak, Kibo, rises 5895 m (19,340 ft) above sea level, and the summit of Mawensi is 5149 m (16,892 ft) above sea level. 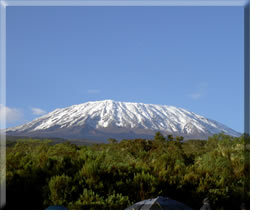 Mount Kilimanjaro, nicknamed the 'Roof of Africa' is proud to be the highest mountain in all of Africa. Not only is this the highest peak on the African continent; it is the tallest free-standing mountain in the world. It rises in breathtaking isolation from the surrounding coastal shrubland and is located in northeastern Tanzania, near the border of Kenya, three degrees south of the equator. This challenging trek took Zeta and Michael along the MACHAME ROUTE, approaching Kilimanjaro from the south, through dense tropical rainforest all the way up to the mighty snowcapped summit at 5895m, for simply breathtaking views. This was a tough but spectacularly rewarding route with steeper ascents than other routes. Reaching the summit gave a real sense of overwhelming achievement. A truly unforgettable challenge. Donations were received and charity events held throughout the year to raise as much as possible towards the continued care of injured Service personnel and bereaved military families. 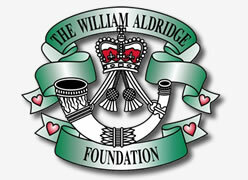 The William Aldridge Foundation has been created to continue and expand on the success of the Kilimanjaro 2010 Appeal, which concluded on completion of the Kilimanjaro Climb - its penultimate event.